Completing his second semester at the at the University at Buffalo, The State University of New York, Esteban Orellana recognizes the importance of studying hard, working hard, and networking to build relationships that will open doors to new opportunities. As a current member of the honors program at his university and a student in the School of Engineering and Applied Sciences, Esteban appreciates the challenges of leaving his comfort zone to interact with fellow students, faculty, community members, and engineering professionals in order to build his academic career. Esteban became an active member of the Society of Hispanic Professional Engineers Foundation (SHPE) at his university after realizing the importance of diversifying and supporting minorities in engineering. 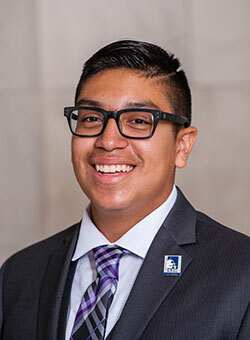 He recently attended the SHPE regional conference and was able to reflect on the unique experiences of first-generation students pursuing a mechanical engineering degree. Esteban also takes part of the Louis Stokes Alliances for Minority Participation (LSAMP) program which assists minority students in their efforts to matriculate and successfully complete degree programs in STEM. Proud of his Guatemalan heritage and his parent’s immigrant background, Esteban worked hard to earn himself a spot on the University at Buffalo’s Dean List last semester with a 3.8 GPA. He is currently seeking summer opportunities to work on research projects focused on studying access to clean water in developing countries. To support dynamic students like Esteban and CHCI’s programs such as R2L NextGen, please visit: www.chci.org/donate.